SK Wholesale is recommended as the reliable baby clothing distributor in Trinidad & Tobago. From start to finish we strive to meet all your needs and deliver 100% customer satisfaction work. Our team of experts guarantees that our experience will exceed your expectations. Dedicated to delivering great quality, unique and well-priced clothes for babies to the Trinidad & Tobago retail market, SK Wholesale’s baby clothing distributor in Trinidad & Tobago offer customers the very best baby clothes that the market has to offer. With years of experience, we offer our customers a wealth of expertise in customer service, sales and relationship management. We understand retail, we love listening to our customers’ needs. We aspire to provide 100% customer satisfaction work. We are confident that you will love our collection of clothes, which presents something for every kind of retailer, be they big or small. We are dedicated on providing our customer with the very best service service. We love what we do. Once you make booking with us you can keep peace of mind that you will be provided with the top notch services. We keep our customers’ requirements on top-priority; we have gained this reputation with our loyal customers. We understand your need, so we never compromise with the quality despite the fact that we offer reasonable price. If you are interested in finding out more about SK Wholesale, or wish to discuss how we can assist you, we would love to hear from you! 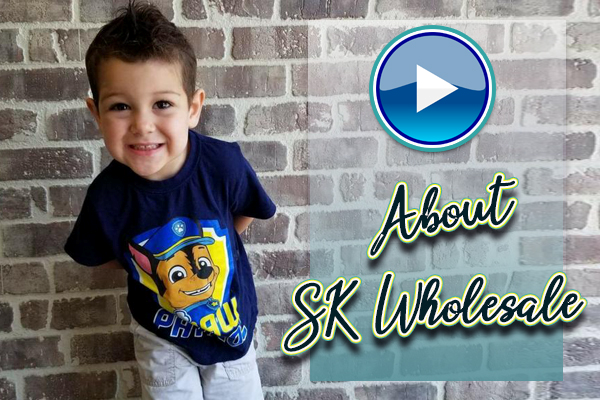 SK Wholesale gives you the possibility of buying kids clothes at a very cheap wholesale cost. With years of experience we have gained extensive knowledge and we expertise in what we do. We are recommended as one of the best children’s clothing supplier in Bahamas. NO job is too big or small for us. We make sure that we meet all your requirements from start to finish. SK Wholesale understands that your time is money and needs are important, so we never compromise on the quality though we provide clothes at affordable rates. Our aim to offer 100% customer satisfaction work has made us the number one children’s clothing supplier in Bahamas. SK Wholesale is operated by professional, qualified personnel with extensive fashion knowledge and a passion for seeking out the latest new products for every season. Quality, Style & Comfort - We guarantee top quality, style and comfort in each attire by combining current trends and top of the line fabrics with the latest fabrication methods. Phenomenal Customer Service - We strive to provide top notch customer service by ensuring prompt and courteous care is taken with each step of the process. Variety - We carry a wide variety of dresses with sizes ranging from new-born to tween, allowing you and your customers’ to select from lots of varieties. Reasonable wholesale rates - Being the exclusive children’s clothing supplier allows us to ensure accuracy, quality and preserve our low prices. Experience – Making children fashionable from decades. Don’t panic! Contact us now for further more information on details. We are always ready and happy to assist you. We guarantee that our experience will exceed your expectations. Looking for the best company for children clothes? Then you are at the right place. SK Wholesale is recommended as the leader on being the best & reliable children’s wear wholesale distributor in Barbados. SK Wholesale aspires to be the largest affordable children’s wear wholesale distributor in Barbados. We understand the value of time and money, so we never compromise with the quality even though we offer our services at reasonable price. Making us as your option will give you peace of mind that you will be provided with top notch quality clothes for kids. SK Wholesale will strive to earn the business & respect of all its members and will help to promote their individual independence. We provide high-quality service and the latest fashion products, timely delivered, accurately and completely, at the lowest net cost which will enable members to affect their competitive price & image in their individual marketplace; thus gaining respect & repeat business from their own local customers. We aim to stir up the members who are already in business to expand in their market segment, customers, product and services and give their business worldwide exposure. We supply you with the very best clothes! We are the children’s wear wholesale distributor in Barbados that allows you to operate your own successful Business and online store without any difficulties! Get in touch with us now for further information on details. Are you looking for the best company for children clothes? Then you are at the right place. SK Wholesale is a reliable children’s wear wholesale distributor in Turks & Caicos since 1988. SK Wholesale strives to be the largest affordable children’s wear wholesale distributor in Turks & Caicos. We understand the value of time and money, so we provide the higest quality clothing at reasonable prices. SKWholesale is your one stop choice for children clothing and will provide you with excellent quality clothing for kids. SK Wholesale will aspire to earn your business & respect and will help promote your individual needs. We provide high-quality services and the latest fashion products with accurate & timely delivery at the lowest cost to you. Our Services will enable you to have competitive prices & trending products. This will enable your business to reach and sell your local customers. We aim to help our customers grow their respective buisnesses and expand their market share & customer base by providing product and services that will give their business worldwide exposure. We will supply you with the very best clothing! We are the children’s wear wholesale distributor in Turks & Caicos that allows you to operate your own successful business and online store without any difficulties! Get in touch with us now for further information on details.